Does the Leica DISTO measure in Metric or Imperial? All the Leica DISTO’s (D110, D2, D210, X310, D5, D510, D8 and D810) have the option of displaying the readings in either feet or inches. Do Leica DISTO's work outside? The D5, D510, D8 and D810 have been designed work outdoors with an integral viewfinder. This enables the user to see the point of measurement over long distances and in bright sunlight. Do the Leica DISTO’s have a warranty? Can you connect a Leica DISTO ™ to a PC or Hand Held computer? The Leica DISTO A6 has a Bluetooth connection to these devices. No other Leica DISTO is capable of connection even with a cable. The PC or hand held device will need to be on site, as the Leica DISTO A6 has limited storage to the last 19 measurments. What are the measuring ranges of the devices? In summary: The Leica DISTO A2 is 60 Metres (indoor only), Leica DISTO ™ A3 and Leica DISTO D3 100 Metres, Leica DISTO A5 and Leica DISTO A6 and Leica DISTO A8 are 200 Metres. Can you measure areas and Volumes? The D2, D210, X310, D5, D510, D8 and D810 all have the option to measure areas and volumes. The D110 is limited to area measurements only. How accurate is Leica DISTO ™ at 0.5m, 1m to 200m? The tolerance is not proportional to the measured distance, it is the same over the entire distance. However, over long distances, additional errors of ±5 ppm (parts per million) (±0.5mm/100m) come into play. Which is the best DISTO for my needs? Please call us on 0845 257 2188 and we would be pleased discuss your requirements and advise on the best device for your needs. We offer also a 30 day trial period. This will enable you to test the product in your normal working environment. Do you get a carrying case with the Leica DISTO? YES, all Leica DISTO’s supplied by us have a protective carrying case included. They also have batteries and a carrying loop. I have purchase another measuring device (sonic) from the hardware / DIY store and find that it is very inaccurate, why is the Leica DISTO ™ different? There are two types of devices on the market. Laser measuring and Sonic measuring devices. The Leica DISTO ™ is very accurate using pin point accurate laser light, the Sonic devices often found at DIY / Hardware use sound to measure the distances that has a greater level of inaccuracy, measures over shorter distances only and may easily offer false readings as the sound may bounce off objects or furniture. I understand that the Leica DISTO’s can now measure inclines? Yes, the Leica DISTO X310, DISTO D5, DISTO D510, DISTO D8 and the Leica DISTO D810 touch all have tilt sensors. Whilst the DISTO D5 is limited to 45°, the DISTO X310, DISTO D510, DISTO D8 and DISTO D810 touch have the ability to measure 360° and, with the exception of the DISTO X310, they can also be used to measure outside. The IP rating relates to an international classification system for the sealing effectiveness of enclosures of electrical equipment against the intrusion into the equipment of foreign bodies (i.e. tools, dust, fingers) and moisture. This classification system utilises the letters “IP” (“Ingress Protection”) followed by two digits. 6 Protection against heavy splashed rain or powerful jets of water. 7 Protection against water immersion. How do you change the battery on the Leica DISTO D2 – Smallest laser measuring device? 1. How can I remove the pocket clip of the DISTO D110? Please proceed as follows to remove the pocket clip. Please press the bottom of the device to unlock and remove the clip. 2. How can I attach the pocket clip to the D110? Please proceed as follows to attach the pocket clip. Please insert the clip through the gap in the bottom of the device. 3. How can I open the battery compartment? 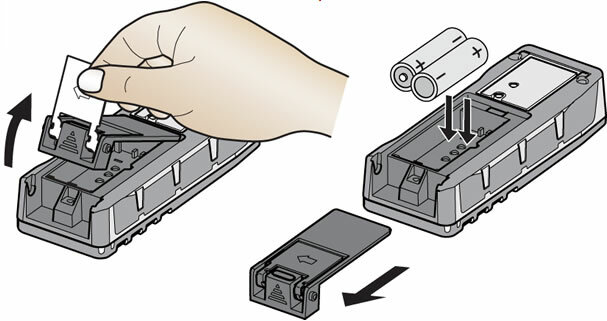 In order to open the battery compartment on the pocket clip needs to be removed. After removing the clip, the battery compartment can be opened. 4. What is the maximum measuring range of the Leica DISTO D110? The device measures distances between 0.2 up to 60 meters. 5. What functions are implemented in the DISTO D110? You can measure distances, areas and execute continuous measurements. You can transfer all measurements via Bluetooth® Smart. 6. How can I turn the beep of the D110 on / off? By pressing the Bluetooth® key and the area key together for 2 Sec the beep can be turned on / off. 7. How can I turn on/off Bluetooth® on the DISTO D110? By pressing the Bluetooth® key for 2 seconds. 8. How can I get one extra year of warranty for the Leica DISTO D110? Our standard warranty of 2 years can be extended by one additional year if you register your device on www.disto.com within eight weeks of the purchase date. If the product is not registered, a two year warranty applies. 9. What does it mean when I attempt a measurement but the unit shows a number on the display versus my measured value? 204 Calculation error Perform measurement again. 240 Data transfer error Repeat procedure. 252 Temperature too high Let device cool down. 253 Temperature too low Warm device up. 254 Battery voltage too low for measurements Change batteries. 256 Received signal too high Change target surface (e.g. white paper). 257 Too much background light Shadow target area. 258 Measurement outside of measuring range Correct range. 260 Laser beam interrupted Repeat measurement. 10. What does ISO 16331-1 standard mean? The range and accuracy of laser distance meters depend greatly on lighting conditions and the reflective properties of the target object. For Leica Geosystems it is important that the performance of the device is maintained not only in the test laboratory but even more so on everyday site tasks. Therefore we have worked with external experts to develop a global standard to test and specify laser distance meters and allow comparisons between devices of different manufacturers. Instruments tested in accordance with ISO 16331-1 achieve their promises. 11. What Bluetooth® technology is integrated in the Leica DISTO D110? The Leica DISTO D110 has Bluetooth® SMART. The devices is working with smartphones or tablets with Bluetooth® 4.0, or are “Smart Ready”. It is also required that the operating system supports this Bluetooth® standard which is the case for iOS devices, Android devices 4.3 or higher, and Windows 8.0 or higher. 12. Can I send measuring data from a Leica DISTO D110 to iOS mobile devices? 13. Can I send measuring data from a Leica DISTO D110 to Android devices? Yes, the Leica DISTO™ D110 can communicate also with Android devices, with operating system 4.3 or higher, and which have integrated Bluetooth 4.0. Used apps should support the corresponding Bluetooth® standard (e.g. Leica DISTO™ sketch). 14. Can I send measuring data from a Leica DISTO D110 to a Windows computer? It is possible to send data to computers running with Windows 8.1 by using the free software DISTO transfer. This free software you can download from our DISTO webpage. Windows 7 and older Windows operating systems do not support Bluetooth 4.0 and therefore do not support data transfer from the Leica DISTO™ D110. 15. Can I send measuring data from a Leica DISTO D110 to Windows mobile, Windows RT or a Blackberry device? 16. Does the Leica DISTO D110 offer apps? Yes. We offer the Leica DISTO™ sketch app. The app is available free of charge for iOS devices on iTunes, and for Android devices on Google play. 1. Does the Leica DISTO D2 measure in Metric or Imperial? All the Leica DISTO's including the Leica DISTO D2 have the option of displaying the readings in either feet or inches. 2. Does the Leica DISTO D2 work outside? The Leica DISTO D2 is designed as an internal laser measure. It is limited by the distance you can see the laser beam. For external measurements see the Leica DISTO ™ D2 and Leica DISTO D8 that use an integrated videol viewfinder for targeting over longer distances. 3. Can you measure areas and Volumes? Yes the Leica DISTO D2 has both Area and volume features. 4. I have purchase another measuring device (sonic) from the hardware / DIY store and find that it is very inaccurate, why is the Leica DISTO ™ different? There are two types of devices on the market. Laser measuring and Sonic measuring devices. The Leica DISTO ™ is very accurate using pin point accurate laser light, the Sonic devices often found at DIY / Hardware use sound to measure the distances that has a greater level of inaccuracy, measures over shorter distances only and may easily offer false readings as the sound may bounce off objects or furniture. See articles section >>. How to change the batteries with the Leica DISTO D2? 1. What happens if a number is visible on the display of my Leica DISTO D2 Bluetooth? 255 Received signal too weak, measuring time too long Change target surface (e.g. white paper). 2. How to switch off/on the beep? The beep on your Leica DISTO D2 Bluetooth can be switched off (and on) with a long press simultaneously on Func key and Bluetooth key. 3. What exactly is the painter function on my Leica DISTO D2 Bluetooth and how does it work? The painter function calculates the sum of several individual wall surfaces with a common height. Press func key 1x to go to the area function. Press DIST key and measure the first wall length, press plus or -minus key again and measure the next wall length. The distance is automatically calculated. Repeat the procedure, until you have measured all wall lengths. 2nd measurement: Measure the wall height. The result displays automatically the wall areas, which you have selected. 4. Which formula stands behind the indirect measuring function Pythagoras? In any rectangular triangle, the theorem of Pythagoras is valid: a²+b²=c². This means the other way round: c=radical of (a²+b²) or b=radical of (c²-a²). One side of the triangle can be calculated, if the other two sides are known. Therefore it is important that the DISTO™ measuring points are at the same level and that measurement 2 is rectangular. With a long press on the DIST-key the minimum function can be activated to get the shortest distance for measurement 2. 5. How to switch off/on the display illumination on the Leica DISTO D2 Bluetooth? The illumination can be switched off (and on) with a long press simultaneously on plus key and reference key. 6. What exactly is the painter function on the Leica DISTO D2 Bluetooth and how does it work? The painter function calculates the sum of several individual wall surfaces with a common height. Press func key 1x to go to the area function. Press plus or minus key and measure the first wall length, press plus or minus key again and measure the next wall length. The distance is automatically calculated. Repeat the procedure, until you have measured all wall lengths. 7. Which formula stands behind the indirect measuring function Pythagoras? 8. Can I use the Leica DISTO D2 Bluetooth with rechargeable batteries? Yes, it is possible to use with standard rechargeable batteries. The more powerful the charger system is, the longer you can measure with the Leica DISTO™. We offer a powerful charger system, which is ideal to use with DISTO™: Leica charger UC20 with 2 Micro AAA NiMH batteries. For more information, please check our accessories. 9. What accessories are recommended for use with Leica DISTO D2 Bluetooth? For measuring of long distances we recommend to use our Leica target plates. If the laser dot is not visible, we recommend you to wear laser glasses (GLB30). 10. How can I get an extra year’s warranty? Our standard warranty of 2 years can be extended by one additional year if you register your device on our website http://www.disto.com/ within eight weeks of the purchase date. If the product is not registered, a two year warranty applies. When products and services meet our expectations, we tend to take this for granted and be unaware of the role of standards. However, when standards are absent, we soon notice. We soon care when products turn out to be of poor quality or are unreliable or dangerous. An ISO Standard ensures consistent quality and reliability for a product. The range and accuracy of laser distance meters depend greatly on lighting conditions and the reflective properties of the target object. For Leica Geosystems it is important that the performance of the device is maintained not only in the test laboratory but even more so on everyday site tasks. Therefore we have worked with external experts to develop a global standard to test and specify laser distance meters and allow comparisons between devices of different manufacturers. Instruments tested in accordance with ISO 16331-1 achieve their promises. Further information can be found on the Leica Geosystems website. 12. How can I turn on/off Bluetooth® on the device? 13. What Bluetooth® technology is integrated in the Leica DISTO D2 Bluetooth? The Leica DISTO™ D2 has Bluetooth® SMART. The devices is working with smartphones or tablets with Bluetooth® 4.0, or are “Smart Ready”. It is also required that the operating system supports this Bluetooth® standard which is the case for iOS devices, Android devices 4.3 or higher, and Windows 8.0 or higher. 14. Can I send measuring data from a Leica DISTO D2 Bluetooth to iOS mobile devices? 15. Can I send measuring data from a Leica DISTO D2 Bluetooth to Android devices? Yes, the Leica DISTO D2 Bluetooth can communicate also with Android devices, with operating system 4.3 or higher, and which have integrated Bluetooth 4.0. Used apps should support the corresponding Bluetooth® standard (e.g. Leica DISTO™ sketch). 16. Can I send measuring data from a Leica DISTO™ D2 to a Windows computer? It is possible to send data to computers running with Windows 8.1 by using the free software DISTO transfer. This free software you can download from our DISTO webpage. Windows 7 and older Windows operating systems do not support Bluetooth 4.0 and therefore do not support data transfer from the Leica DISTO D2 Bluetooth. 17. Can I send measuring data from a Leica DISTO D2 Bluetooth to Windows mobile, Windows RT or a Blackberry device? 18. Does the Leica DISTO D2 Bluetooth offer apps? 1. What happens if a number is visible on the display of my Leica DISTO D210? The beep on your Leica DISTO D210 can be switched off (and on) with a long press simultaneously on minus key and reference key. 3. How can I activate the keypad lock on my Leica DISTO D210? To activate the keypad lock, press CLEAR/OFF key and minus key simultaneously for 2 sec. 4. How can I deactivate the keypad lock? To deactivate the keypad lock press the ON/DIST key and afterwards (within 2 Sec.) the MINUS key. Now the keypad lock is deactivated and the device is switched on. 5. How to switch off/on the display illumination on the Leica DISTO D210? 6. What exactly is the painter function on the Leica DISTO D210 and how does it work? In any rectangular triangle, the theorem of Pythagoras is valid: a²+b²=c². This means the other way round: c=radical of (a²+b²) or b=radical of (c²-a²). One side of the triangle can be calculated, if the other two sides are known. Therefore it is important that the Leica DISTO D210 measuring points are at the same level and that measurement 2 is rectangular. With a long press on the DIST-key the minimum function can be activated to get the shortest distance for measurement 2. 8. Can I use the Leica DISTO D210 with rechargeable batteries? Yes, it is possible to use with standard rechargeable batteries. The more powerful the charger system is, the longer you can measure with the Leica DISTO™. We offer a powerful charger system, which is ideal to use with DISTO™: Leica charger UC20 with 2 Micro AAA NiMH batteries, For more information, please check our accessories. 9. What accessories are recommended for use with Leica DISTO D210? Our standard warranty of 2 years can be extended by one additional year if you register your device on the Leica Geosystems website within eight weeks of the purchase date. If the product is not registered, a two year warranty applies. How accurate is the tilt sensor in the Leica DISTO D3? For example, if a distance of 10m is measured at an angle of 10o, the error on the direct horizontal distance (fd) is 9mm. If a distance of 10m is measured an angle of 45o, the error on the direct horizontal distance (fd) is 37mm. To obtain the best result using indirect measurement and minimise the deviation, the device should be held as close to the horizontal as possible. What is the angular range of the tilt sensor in the Leica DISTO D3? The integral tilt sensor in the Leica DISTO D3 functions in the range ± 45o and at a transverse tilt of > ± 10o. The display indicates if the tilt is in the range >± 50o. A line appears on the display with the text max. and an infocode i 160, which means that the device is being used outside its permissible range. If the device is held at > ± 10o transversely, a similar line appears on the display, which indicates the transverse tilt with the text “max”. The infocode i 156 indicates that the device is tilted too much and that you should be aware that inaccurate measurements would be taken. What units of tilt are integrated into the Leica DISTO D3? Can a Leica DISTO D3 be calibrated by the user? Yes, it is possible to obtain detailed information about the measurements of areas and volumes in the Leica DISTO D3: After the measurements have been taken (area/volume), the “Area/Volume” key must be held down and then detailed information about the measurements carried out is shown in the display. What accessories are recommended for the Leica DISTO D3? For long distances we recommend using a tripod, even indoors. A tripod provides additional steadiness and therefore allows accurate targeting, especially over long distances. We particularly recommend the Leica TRI100 tripod. Can the Leica DISTO D3 also be used to measure horizontal angles? No, the integral tilt sensor can only measure vertical angles. If the device is held at a transverse tilt angle greater than ±10o the display shows an infocode 156, which means that the device is required to be held level (transversely). Which customer segment would find the Leica DISTO D3 of most use for everyday tasks? The Leica DISTO ™ D3 is a great measurement aid for a wide range of target groups and is a superbly multitalented device for indoor tasks. The device is particularly suitable, but of course not exclusively, for the following users: architects, interior architects, electricians, carpenters, kitchen installers, floor layers, joiners, heating engineers, window installers, decorators and many others. Can the automatic key and display illumination be switched off from the device? The automatic key and display illumination can be switched off in menu item 6. If the sensor is switched off, the device no longer illuminates the keys or display. Leica DISTO X310 - Frequently asked questions. What happens if a number is visible on the display? 162 Calibration mistake Make sure, the device is placed on an absolutely horizontal and flat surface. Repeat the calibration procedure. If the mistake still occurs, contact your dealer. How to switch off/on the beep? The beep can be switched off (and on) with a long press simultaneously on minus key and reference key. How to switch off/on the display illumination? To activate the keypad lock, press CLEAR/OFF key and minus key simultaneously for 2 sec. To deactivate the keypad lock, press ON/DIST key and within 2 sec minus key. What is the angular range of the Leica DISTO X310? The angular range of the Leica DISTO™ X310 is 360°. What units of tilt can be used for the Leica DISTO X310? The following units can be used: °, %. What exactly is the painter function and how does it work? The painter function calculates the sum of several individual wall surfaces with a common height. Press func key 1x to go to the area function. Press plus- or minus key and measure the first wall length, press plus or -minus key again and measure the next wall length. The distance is automatically calculated. Repeat the procedure, until you have measured all wall lengths. 2nd measurement: Measure the wall height. The result displays automatically the wall areas, which you have selected. How can I clean the DISTO X310? The device with its keypad and display can be easily cleaned under running water. Attention should be taken, that the water-jet is not directed onto the optical lens. If water is on the optical lens, it should be removed with a soft cloth. Water droplets can act as a lens and deflect the laser beam. Measuring with tripod - is there anything to consider? The measuring reference has to be adjusted to the tripod thread. Press reference key 2 times and the tripod-reference is set permanently until the device switches off. After switching off the device goes back to the standard setting (rear of device). Can I calibrate the tilt sensor myself? Yes, it is possible. The procedure is described in the manual. Normally it is not necessary to calibrate the tilt sensor as it is already calibrated from Leica Geosystems. Only if a user detects an inaccuracy or after a strong drop it makes sense to calibrate the tilt sensor. For example, if a distance of 10m is measured with an angle of 10°, the error on the direct horizontal distance (fd) is 6mm. In order to have best results with indirect measurements considering the deviation of the tilt sensor use the Leica DISTO™ as follows. For measuring distances use the instrument as flat as possible. Can I measure horizontal angles with the Leica DISTO X310? No, the integrated tilt sensor measures only vertical angles. If the device is held with a transverse tilt greater than ±10° the display shows a message code 156, which means that the device should be held level (transversely). Yes, for some functions additional measuring information could be displayed. If a small triangle is visible in the left lower edge of the display, a long press on the prior function button shows additional information. Can the historical memory in the device be erased? Yes - a simultaneous press of 2 sec on CLEAR/OFF and UNIT/MEMORY key will erase the complete memory. Can I use the DISTO X310 with rechargeable batteries? For long distances we recommend using a tripod, even indoors. A tripod provides additional steadiness and therefore allows accurate targeting, especially over long distances. We particularly recommend the Leica TRI70 with the adapter TA30 or LA360 and the Leica TRI 100 tripod. To enlarge the measuring range (especially outside), we recommend to use our target plates. If the laser dot is not visible, we recommend wearing laser glasses (GLB30). How can I get an extra year’s warranty? Our standard warranty of 2 years can be extended by one additional year if you register your device on our website www.disto.com/ within eight weeks of the purchase date. If the product is not registered, a two year warranty applies. When products and services meet our expectations, we tend to take this for granted and be unaware of the role of standards. However, when standards are absent, we soon notice. We soon care when products turn out to be of poor quality or are unreliable or dangerous. An ISO Standard ensures consistent quality and reliability for a product. How easy is the Leica DISTO D5 to use? Very Easy. The new on screen colour menu system combined with buttons that are clearly marked with images explaining the different laser measuring functions makes the Leica DISTO ™ D5 easier to use that some of its predecessors. Included with the device is image based quick reference guide and we are always available to help simply call 0800 292 2188 for FREE friendly support from one of our product specialists. What is the Digital Pointfinder? The integrated digital Pointfinder on the Leica DISTO D3 enables the user to sight a target using a real time colour video image on the screen. This is similar to the screen on most digital cameras and has 1x, 2x and 4x magnification zoom so you can accurate highlight the target in the central target marks on the screen. The zoom level is shown in the left top corner of the screen. To change from one zoom level to the next one you have to press the “Digital Pointfinder” key ( top left of the Leica DISTO D5 Keypad) The zoom levels will rotate around. Can the brightness of the digital screen be adjusted when viewing in sunlight? Yes, on the screen of the digital Pointfinder on top of the crosshair you see a symbol existing of a “Sun” and a “+” and “-”. By pressing the “Plus” and “Minus” key you are able to adjust the brightness in 5 steps. The screen is very clear in all conditions. How accurate is the digital tilt sensor on the Leica DISTO D5? The accuracy of the tilt sensor in the device is ±0.30 to the laser beam respectively ±0.30 to the housing of the device. What units of tilts are integrated into the Leica DISTO D5? You can set the Leica DISTO D5 to use different tilt units. Select in the menu the submenu “Units” and choose between 0 , %, in/ft and mm/m. What is the angular range of the tilt sensor in the Leica DISTO D5? The integrated tilt sensor in the Leica DISTO D5 functions in the range ±450 and at a transverse / sideways tilt of < ±100. If the tilt is in the range > ±500 an info code “i160” appears in the display, which means that the device is being used outside its permissible range. If the Leica DISTO ™ is held at > ±10o transversely, the info code “i156” appears in the display and indicates that the device is tilted too much. Does the Leica DISTO D5 require calibration? Can the tilt sensor of a Leica DISTO D5 be calibrated by the user? Carry out the first measurement by pressing “ON/DIST” key on a level surface. The device confirms the measurement. Rotate the device horizontally 1800. Press the “=/Menu” key to confirm that the device was rotated 1800. Is it possible to obtain more detailed information about the measurements taken? Yes, on many of the calculation functions it is possible to obtain additional detailed information in the Leica DISTO D5. These is included in the measurement of areas, volumes, Pythagoras and the trapezoid functions. After the measurement have been taken, simply press and hold the relevant function key again. What accessories are recommended for the Leica DISTO D5? Can the Leica DISTO D5 also be used to measure horizontal angles? No, the integrated tilt sensor can only measures vertical angles. If the device is held at a transverse tilt angle greater than ±100 the display shows an info code “i156”, which means that the device is required to be held level (transversely). What is the circle on the keypad above the “Timer” key? The Leica DISTO D5 has a sensor to detect the brightness of the display. If the device is used outside in bright sunshine this sensor automatically adjusts the brightness for the display to save energy. Additionally an adjustment can be made in the menu. In the relevant submenu the brightness of the entire display can be adjusted in 6 steps. Can the historical storage memory of 20 values in the device be erased? Which batteries should I use for the Leica DISTO D5 and how long will they last? In general you can use any alkaline battery or any rechargeable batteries (2xAA). 2xAA batteries are included with your device. Battery life will vary depending upon use. However tests have proven that this is quite extensive. The largest drain on power is the digital point finder. This however does not remain on all the time and is only used when required for a short time only. How many zoom levels does the Leica DISTO D510 have? The integrated digital Pointfinder in the device has 1x, 2x and 4x zoom. You can see in the middle of the status bar of the screen, which zoom level you have selected. To change from one zoom level to the next one you have to press the "up/down arrow keys". Yes, when turning the digital Poinfinder on it is indicated in the display that you can change the brightness with the left and right arrow keys on the keypad. In this case the laser dot appears displaced in reference to the crosshair. This is not an error! How accurate is the tilt sensor in the Leica DISTO D510? What units of tilts are integrated into the Leica DISTO D510? You can set the Leica DISTO D510 to use different tilt units. Select in the settings “Units inclination” and choose between ° , %, in/ft and mm/m. -> The level function in the right hand top corner of the display can also be switched on/off in the ssettings “level”. It is always set to 0.0° and can not be changed into a different unit for tilts. What is the angular range of the tilt sensor in the Leica DISTO D510? The integrated tilt sensor in the Leica DISTO™ D510 functions in the range 360° and at a transverse tilt of < ±10°. If the device is held at > ±10° transversely, the info code “i156” appears in the display and indicates that the device is tilted too much. Can the tilt sensor of a Leica DISTO D510 be calibrated by the user? You can recalibrate the zero level of the integrated tilt sensor. In the settings choose the icon for calibration. When you select calibration you will be guided through the process. Lay the unit down on a flat surface. The side with the typelabel should be down on the table. Turn the device horizontally by 180° and place it again on absolutely flat surface with the typelabel side down. Carry out the second measurement by pressing “ON/DIST” key on a level surface. The device confirms the measurement. Pick the unit up and then place it the laser facing up on an absolutely flat surface. Carry out the third measurement by pressing “ON/DIST” key on a level surface. The device confirms the measurement. Keeping the laser up on the flat surface, rotate the device horizontally by 180° while keeping it in the same location on the flat surface. Carry out the fourth measurement by pressing “ON/DIST” key on a level surface. The device confirms the measurement. After 2 Sec. the device goes back to the basic mode and you have completed the calibration procedure. Please note: The calibration process can be proceeded by placing the unit with the lens up or down to the surface. A better accuracy in the calibration procedure is achieved having the back of the unit down on the surface and the lens up. Yes, it is possible to obtain detailed information in the Leica DISTO D510. If detail information is available this will be indicated with two small arrows in the center of the status bar in the display. You can now navigate with the arrow keys up and arrow key down between the available measurements. What accessories are recommended for the Leica DISTO D510? Please note: When using the tripod with its standard tripod head you need to change the measuring reference on the Leica DISTO to the tripod thread (in the setting). For long distances we recommend using a tripod, even indoors. A tripod provides additional steadiness and therefore allows accurate targeting, especially over long distances. We particularly recommend the Leica TRI70tripod in combination with the adapter TA360. In order to achieve more flexibility we are offering the tripod adapter TA360. This adapter is made of aluminum which makes it very stable and accurate to be used as a tripod head. (TRI 100 and TRI70). A major benefit of the TA360 is that you can fix your Leica DISTO exactly that way that the tripod tilt and rotating axis and the instrument laser axis meet exactly in one point. This allows to do exact measurements even when turning the unit horizontally. Please note: When using the TA 360 adapter you don’t need to change the measuring reference on your Leica DISTO because the tilt axis is exactly at the instrument back end. Can the Leica DISTO D510 also be used to measure horizontal angles? For example, if a distance of 10m is measured at an angle of 10°, the error on uncertainty on measurement on the direct horizontal distance (fd) is 6mm. -> in order to have best results with the direct horizontal distance measurements, considering the deviation of the tilt sensor, use the Leica DISTO™ D510 as flat as possible. Which customer segment would find the Leica DISTO D510 of most use for everyday tasks? The Leica DISTO™ D510 is a great measurement tool for a wide range of target groups and is a superb device that’s especially designed for outdoor tasks. The device is particularly suitable, but of course not exclusively, for the following users: Professions who measure (at least partly) outdoor: General Construction, Excavator, Gardener / Landscaper,Roofer, Solar panel installer, Metal and glass construction, Painter, Real Estate, Facility Manager, Architects, Innovative users. Which batteries should I use for the Leica DISTO D510? In general you can use any alkaline battery or any rechargeable batteries (2xAA). In the scope of delivery we provide high quality Li-ion batteries (not rechargeable) and we recommend to use such batteries or any (NiMH) batteries. How can I get one extra year of warranty for the Leica DISTO D510? Please note: The measuring reference must be changed except when using the tripod adapter TA 360 from Leica. There the tilt axis is exactly at the back end of the Leica DISTO™. Can I use the DISTO D510 with rechargeable batteries? Yes, it is possible to use with standard rechargeable batteries. The more powerful the charger system is, the longer you can measure with the Leica DISTO. We offer a powerful charger system, which is ideal to use with DISTO: Leica universal quick charger with 2 Micro AA NiMH batteries. For more information, please check our accessories. Press the left and right top keys for 2 Sec. The icons blink now you can choose the functions you would like to put on the left and right favorite keys. Pressing the left key puts the function on the left side. Pressing the right key puts the function on the right side. It is an easy way to put the functions on the keys that you use most. What Bluetooth technology is integrated in the Leica DISTO D510? The Leica DISTO D510 has Bluetooth SMART integrated. The device is working with Apple iOS devices that have Bluetooth 4.0 or Smart Ready and also with windows computer that haveBluetooth 4.0 or Smart Ready. Can I send measurement data from a Leica DISTO D510 to Apple devices? Yes with the Leica DISTO D510 it is now possible to communicate with Apple devices *. * Note: The DISTO Sketch App is only fully functioning with Bluetooth Smart Ready devices (with the new Bluetooth standard V4.0). Eg. iPhone 4S, 5, iPad 3 & iPad Mini. All other Bluetooth devices do not support the energy saving Bluetooth Smart Module, which is integrated in the device. How many zoom levels does the Leica DISTO D8 have? How accurate is the tilt sensor in the Leica DISTO D8? The accuracy of the tilt sensor in the device is ±0.1o to the housing of the device. To the laser beam the maximum deviation can be up to -0.1o and +0.2o. This applies at room temperature (20oC - 30oC). At any other temperatures the maximum deviation increases by ±0.1o. What units of tilts are integrated into the Leica DISTO D8? You can set the Leica DISTO ™ D8 to use different tilt units. Select in the menu the submenu “Units” and choose between o , %, in/ft and mm/m. -> The level function in the right hand top corner of the display can also be switched on/off in the submenu “level”. It is always set to 0.0o and can not be changed into a different unit for tilts. What is the angular range of the tilt sensor in the Leica DISTO D8? The integrated tilt sensor in the Leica DISTO ™ D8 functions at any angle (360o) and at a transverse tilt of < ±10o. If the device is held at > ±10o transversely, the info code “i156” appears in the display and indicates that the device is tilted too much. Can the tilt sensor of a Leica DISTO D8 be calibrated by the user? Rotate the device horizontally 180o. Press the “=/Menu” key to confirm that the device was rotated 180o. Press the “ON/DIST” key and take the second measurement. The device confirms the measurement. Yes, it is possible to obtain detailed information in the Leica DISTO D8 about the measurements of areas, volumes, Pythagorean and trapezoid functions, indirect measurements and triangle areas. After the measurements have been taken, keep the relevant function key pressed. What accessories are recommended for the Leica DISTO D8? For using the Leica DISTO ™ on a set up pole as it is used e.g. for GPS applications we recommend the use of this LSA360 Adaptor. The reference point for measurements is the back of the Leica DISTO ™. The lateral offset of the DISTO ™ on the adaptor to the center of the pole varies due to the different pole diameters. The LSA360 can also be used on the middle column of the Leica TRI100 (tripod head can be removed). Doing indirect measurements from there will increase the accuracy because laser axis of the Leica DISTO ™ and tilting axis of the Leica TRI100 are both at the same height level at the back of the Leica DISTO ™. Can the Leica DISTO D8 also be used to measure horizontal angles? No, the integrated tilt sensor can only measures vertical angles. If the device is held at a transverse tilt angle greater than ±10o the display shows an info code “i156”, which means that the device is required to be held level (transversely). For example, if a distance of 10m is measured at an angle of 10o, the error on uncertainty on measurement on the direct horizontal distance (fd) is 3mm. If a distance of 10m is measured at an angle of 45o, the uncertainty of measurement on the direct horizontal distance (fd) is 12mm. -> in order to have best results with the direct horizontal distance measurements, considering the deviation of the tilt sensor, use the Leica DISTO D8 as flat as possible. Which customer segment would find the Leica DISTO D8 of most use for everyday tasks? The Leica DISTO D8 is a great measurement tool for a wide range of target groups and is a superbly device especially designed for outdoor tasks and/or use to transfer data into computers. The device is particularly suitable, but of course not exclusively, for the following users: Architects, Surveyors, Facility Managers, Civil Engineer, Real Estate, General Construction, Scaffolding, Painters, Facade Workers, Joiners, Firemen, Gardening Companies, Educational Institutions, Electrical Services, Insurance Companies, Telecommunications, Police, etc. The Leica DISTO D8 has a sensor to detect the brightness of the display. If the device is used outside in bright sunshine this sensor automatically adjusts the brightness for the display to save energy. Additionally an adjustment can be made in the menu. In the relevant submenu the brightness of the entire display can be adjusted in 6 steps. Which batteries should I use for the Leica DISTO D8? In general you can use any alkaline battery or any rechargeable batteries (2xAA). In the scope of delivery we provide high quality batteries and we recommend to use such batteries or any (NiMH) batteries. Please note that it is not allowed to use Lithium-Ion rechargeable batteries in your Leica DISTO ™. No, you can use this function in any horizontal position. This allows you to use the Leica DISTO D8 as one person operating digital level. The accuracy depends mainly on the used distance and the accuracy of the inclination sensor. For usage up to 10m on a 1.5m tripod height deviations of up to 17mm are possible. Additional deviations are possible depending on the tripod that is used (due to distance between laser axis and tilt axis of tripod), best results will be achieved by using the adaptor LSA360 on a middle column of a tripod. When using the Leica DISTO D8 over larger distances (>10m) we recommend to measure on a vertical target plate like e.g. the setup target plate in the scope of delivery. Please note, measure the reference point and all other points on the same height and this height is automatically compensated! Does the double tilt measurement with two measured distances only work on back bent objects? Can I use the Leica DISTO ™ D8 to measure overhead? Yes, with the Leica DISTO D8 you can measure any angle, even overhead. Only when using indirect measuring functions with tilt sensor you have to use the device in a range for angles of ± 90o. Which system requirements does my PC need to work with DISTO ™ transfer? Generally the Leica DISTO ™ transfer works on all desktops, laptops, tablet PCs and UMPCs equipped with Microsoft Windows SE, ME, XP or Vista. Of course the computer must have a Bluetooth® interface or you have to install a Bluetooth® stick. Using an external Bluetooth® stick the computer must fulfill the requirements of the Bluetooth® stick. Which system requirements does my PDA need to work with DISTO ™ transfer? The DISTO ™ transfer works on PDAs with Bluetooth® interface as long it has Windows Mobile 2003 SE respectively 2005 or Windows Mobile 5.0 and Windows Mobile 6.0 installed. Very good experience we have with PDA devices from HP. Of course to install DISTO ™ transfer on a PDA a PC is required. On this PC Microsoft ActiveSync needs to be installed in order to download DISTO ™ transfer to the PDA. Does DISTO ™ transfer support the use of Apple Mac computers? No it doesn't. To use your Leica DISTO ™ with an Apple Mac you need to buy a software from a third party developer. Does DISTO ™ transfer support the use of Palm pocket PC? No it doesn't. 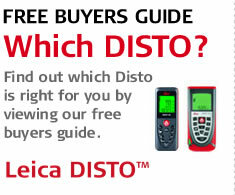 To use your Leica DISTO ™ with a Palm you need to buy a software from a third party developer. Does DISTO ™ transfer support the use of mobile phone like Blackberry or Smart phone with Windows Mobile 6.0? DISTO ™ transfer does not work on mobile phones except of Smart phones with Windows Mobile 6.0. Please note that these Smart phone only have a reduced version of Excel which limits the comfort for use with the Leica DISTO ™. Another limiting factor is the T9 predictive text technology. What is DISTO ™ transfer and how does this work? DISTO ™ transfer is a program which once started is running in the background. Data which are send from a Leica DISTO ™ device are collected by the transfer software and this simulates a keyboard entry to the active window. So the value will be transferred in any application window that is active in the position of the cursor. This very versatile procedure that you can use your Leica DISTO ™ with almost every Windows application. You only need to select the format you want to receive the data (with units, enter (in Excel the cursor jumps to the cell below), tabulator (in Excel® the cursor jumps to the cell to the right)). Which limitations does the Bluetooth® technology have for the use with Leica DISTO ™? Which Bluetooth® driver are supported by Leica DISTO ™ transfer PC? Leica DISTO ™ transfer PC supports directly the Bluetooth® driver from Microsoft® and Broadcom® (Widcomm-driver). If your computer is working with a different driver you can uninstall it (Control panel -> Remove programs) and restart your computer. Follow the instruction to install the recommended Microsoft® driver. Alternatively you can start the program Leica DISTO ™ transfer – Bluetooth install. Further instructions and the name of the installed driver are displayed in a new window. Click for using a virtual Bluetooth COM-interface. Use the Bluetooth manager to create the connection (pair). If you are asked to enter a code please type in the field “0000“. The connection between the Leica DISTO ™ and your PC should be established automatically each time you are starting Leica DISTO ™ transfer. Can I use the DISTO ™ transfer program together with more than one Leica DISTO ™? Yes you can. You have to start the Bluetooth® setup with all instruments switched on (Bluetooth® also on). All DISTO's will be displayed with the corresponding com-port it will be connected to. You have now to start DISTO ™ transfer multiple times and each transfer will connect to a different DISTO ™. please note that from all transfer programs the data will be transferred in the active window. Can I use my Leica DISTO ™ together with AutoCAD®? Yes you can. During the installation of Leica DISTO ™ transfer PC it will be checked whether you are having an AutoCAD® installation on your computer. If this is the case an AutoCAD® plugIn will be installed. This plugIn enables you to draw layouts by using the navigation keys and by transfering measurement data from the Leica DISTO ™ to the PC. If you are using the angle tracking function on the Leica DISTO D8 AutoCAD® calculates the horizontal distance each time for the layout. If the measured angle is >75o the distance is interpreted as a height and the calculated vertical height is added to the drawing. When going into 3D display mode in AutoCAD® you can see the 3D layout. When you are starting the Leica DISTO ™ transfer program it will be checked whether there is a AutoCAD® installation on the computer. If this is the case the plugIn will be installed automatically. Start the AutoCAD® program and type the command “leicadisto“ into the command line of AutoCAD® . Leica DISTO ™ transfer will automatically be started. Which other software is available to use with my Leica DISTO D8? How can I get one extra year of warranty for the Leica DISTO D8? How many zoom levels does the Leica DISTO D810 touch have? The integrated digital Pointfinder in the device has an overview camera and additional 1x, 2x and 4x zoom. You can see in the middle of the status bar of the screen, which zoom level you have selected. To change from one zoom level to the next one you have to press the “up/down arrow keys” or you zoom in on the touchscreen as you are used on mobile phones. Can I take photos with the Leica DIST0 D810 touch and what is the resolution? Yes, it is possible to take photos and screenshots. The photos taken have a resolution of 800 x 600 pixels and screenshots have a resolution of 240 x 400 pixels. The photos and screenshots are saved in jpg format. How can I download my photos from the Leica DIST0 D810 touch to a computer? Photos and screenshots can be downloaded to a computer via USB interface. The DISTO™ will be automatically connected (plug and play). It is now possible to download data from the DISTO™ by using a file manager like the Windows Explorer. Please note: It is not possible to upload data to the DISTO™ and it is not possible to delete files from the computer on the device. Deleting files must be directly done in the DISTO™ Gallery function. Why is the laser dot on short distances not centered in the crosshair? How accurate is the tilt sensor in the Leica DISTO D810 touch? What units of tilts are integrated into the Leica DISTO D810 touch? You can set the Leica DISTO™ D810 touch to use different tilt units. Select in the settings “Units inclination” and choose between ° , %, in/ft and mm/m. -> The level function in the right hand top corner of the display can also be switched on/off in the settings “level”. It is always set to 0.0° and can not be changed into a different unit for tilts. What is the angular range of the tilt sensor in the Leica DISTO D810 touch? The integrated tilt sensor in the Leica DISTO™ D810 touch functions in the range 360° and at a transverse tilt of < ±10°. Can the tilt sensor of a Leica DISTO D810 touch be calibrated by the user? 1) Lay the unit down on a flat surface. The side with the typelabel should be down on the table. 2) Carry out the first measurement by pressing “ON/DIST” key on a level surface. The device confirms the measurement. 3) Turn the device horizontally by 180° and place it again on absolutely flat surface with the typelabel side down. 4) Carry out the second measurement by pressing “ON/DIST” key on a level surface. The device confirms the measurement. 5) Pick the unit up and then place it the laser facing up on an absolutely flat surface. 6) Carry out the third measurement by pressing “ON/DIST” key on a level surface. The device confirms the measurement. 7) Keeping the laser up on the flat surface, rotate the device horizontally by 180° while keeping it in the same location on the flat surface. 8) Carry out the fourth measurement by pressing “ON/DIST” key on a level surface. The device confirms the measurement. 9) After 2 Sec. the device goes back to the basic mode and you have completed the calibration procedure. Please note: The calibration process can be proceeded by placing the unit with the lens up or down to the surface. A better accuracy in the calibration procedure is achieved having the back of the unit down on theease follow this procedure to recalibrate: surface and the lens up. Yes, it is possible to obtain detailed information in the Leica DISTO™ D810 touch. If detail information is available this will be indicated with two small arrows in the center of the status bar in the display. You can now navigate with the arrow keys up and down between the available measurements. The Leica DISTO D810 touch is the first laser distance meter providing functions for measuring with the picture. What is the accuracy of such measurements? The accuracy highly depends on how the function is used. Best results can be achieved when the measuring object is displayed maximum size at the DISTO™. In such case the accuracy is below 1% of the measured object. This applies for width, area and diameter measurements. What accessories are recommended for the Leica DISTO D810 touch? Please note: When using the tripod with its standard tripod head you need to change the measuring reference on the Leica DISTO™ to the tripod thread (in the setting). For long distances we recommend using a tripod, even indoors. A tripod provides additional steadiness and therefore allows accurate targeting, especially over long distances. We particularly recommend the Leica TRI70tripod in combination with the FTA360 and TA360 adapter. In order to achieve higher accuracy we are offering the tripod adapter FTA360 with fine adjustment for convenient and accurate aiming. This adapter is designed to be used as a tripod head (TRI100 and TRI70) or can simply be placed on a flat ground. A major benefit of the FTA360 adapter is that you can fix your Leica DISTO™ exactly that way that the tripod tilt and rotating axis and the instrument laser axis meet exactly in one point. This allows to do exact measurements even when turning the unit horizontally. The adapter can be used with the Leica DISTO™ D510 (an offset of -0,065m (-2 9/16 in) needs to be entered in the D510 device) and the Leica DISTO™ D810 touch. (you can select the adapter in the Reference options of the D810 touch). Can the Leica DISTO D810 touch also be used to measure horizontal angles? How can I get one extra year of warranty for the Leica DISTO D810 touch? Our standard warranty of 2 years can be extended by one additional year if you register your device on our websitehttp://www.disto.com/ within eight weeks of the purchase date. If the product is not registered, a two year warranty applies. The range and accuracy of laser distance meters depend greatly on lighting conditions and the reflective properties of the target object. For Leica Geosystems it is important that the performance of the device is maintained not only in the test laboratory but even more so on everyday site tasks. Therefore we have worked with external experts to develop a global standard to test and specify laser distance meters and allow comparisons between devices of different manufacturers. Instruments tested in accordance with ISO 16331-1 achieve their promises. Further information can be found on our website:http://www.disto.com/. What Bluetooth technology is integrated in the Leica DISTO D810 touch? Can I send measurement data from a Leica DISTO D810 touch to Apple mobile devices? Can I send measurement data from a Leica DISTO D810 touch to Android devices? Can I send measurement data from a Leica DISTO D810 touch Windows computers? Can I send measurement data from a Leica DISTO D810 touch to Windows mobile, Windows RT or Blackberrys? My software only supports comma as a decimal marker and not a dot. Can I change this on the Leica DISTO D810 touch? I need to fill out a form in the Internet or a spreadsheet and it is required to jump to the next input box with a Tab or with Enter after each measurement. Can I change this on the Leica DISTO D810 touch? It need to use navigation keys to move in my spreadsheet to the required input box. Can I do this remotely from my DISTO D810 touch? Yes, this is possible. When you have connected your DISTO device with a smartphone or tablet or computer the content of the selection keys change for supporting the Bluetooth communication. With the left selection key you can switch on and off the navigation function where you can use the arrow keys of the DISTO™ for navigation. In the text mode the measurement result will be transferred as shown in the DISTO display. This includes units or fractions for feet and inch. In the spreadsheet mode only numbers are transferes without any unit information. Units with fractions will be converted to the corresponsing unit with decimal. This makes further calculations like e.g. in Excel much easier. How long does it take to charge the Li-Ion battery of the Leica DISTO D810 touch? This depends from the used charger. With the charger out of the scope of delivery it takes approx. 4 hours to charge the Li-ion battery. Is it possible to replace the Li-Ion battery of the Leica DISTO D810 touch? Does Leica DISTO offer Apps? Yes. Leica Geosystems offers an App DISTO sketch. This App is available for iOS on iTunes and for Android on Google play. We respect your privacy, your details are never shared with 3rd parties.